Energy efficiency has been the trend of the 21st century in view of global warming and various climate issues that may negatively affect the Earth irreversibly. Besides, efficiency and effectiveness of power management in notebook, laptop, netbook and nettop computer, which depends on battery to power up when not plug into AC power adapter or charger, will drastically improve or reduce the duration of battery life. Windows 7 PowerCfg command-line utility has added a new functionality that can evaluate system energy efficiency for Windows operating system platform, generate details power management report in HTML format, and inspect and detect common energy efficiency problems such as inefficient power policy settings, excessive processor utilization, increased timer resolution, battery capacity degradation, USB device selective suspend issues, and platform firmware problems that relate to processor power management capabilities. B rectifying the power consumption related issues, it’s possible to improve battery life backup length and indirectly reduce electricity bill. 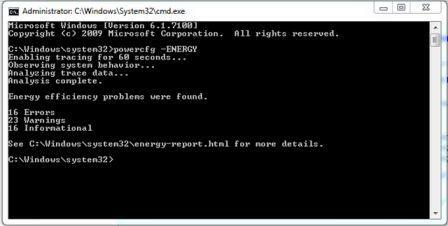 The analyzing of energy efficiency in Windows 7 supported by a new command-line option, ENERGY switch to PowerCfg. To generate the Power Management Report, it’s recommended to run the command when system is idle. Click on Start button -> All Programs -> Accessories, and right-click on Command Prompt then select Run As Administrator to open an elevated command prompt window. Alternatively, type Cmd in Start Search, and then press Ctrl + Shirt + Enter or right click on Cmd in search result and click Run as Administrator. After energy efficiency analysis process is completed, an output HTML report file named energy-report.html will be created in the current directory where the command was executed. The report file, which can be view in any web browser, lists the devices and drivers that has energy-related issues such as hampering Sleep or hindering the full power saving features of the machine, and gives users a snapshot of your system energy consumption over a 60 second period. It also lists if the hardware is capable of S1, S2, S3 or S4 sleep modes. It’s possible to change output path by using -OUTPUT switch, and generate the report in XML format with -XML switch. Microsoft has provided an detailed documentation which details how to user PowerCfg to evaluate system energy efficient, explanation to understand energy efficiency problems, advanced PowerCfg techniques and troubleshooting the PowerCfg -ENERGY command. Download the PowerCfg.docx document. More tips and tricks on using Windows 7.